While USC consistently draws both the most talented students from around the globe, and faculty members who produce scholarly and creative work that changes our world, we remain fully committed to the communities that surround us in Los Angeles. At the heart of our mission is a longstanding dedication to our local neighborhoods, a solid commitment to nurturing bonds that remain mutually beneficial. Perhaps no effort reflects this more strongly than our Neighborhood Academic Initiative (NAI). This vibrant program supports low-income, at-risk students and their families with educational and social services. Beginning in sixth grade, NAI students come to USC for seven full years of accelerated classes, Saturday schooling, and college counseling. Those who meet USC’s competitive admissions requirements receive full financial support for their undergraduate education. This initiative has become a model for other universities’ programs, and we are now in the process of expanding it to our Health Sciences campus. In addition to NAI, USC has seen outstanding results with its Family of Schools program, and we now look to build on this success with another innovative program: USC Family of Businesses. This initiative will provide local businesses with community broadband connectivity, as well as technical assistance in communications, website design, marketing, and traditional business consulting services. These businesses will also draw on the scholarly and creative expertise of USC’s diverse schools and units. 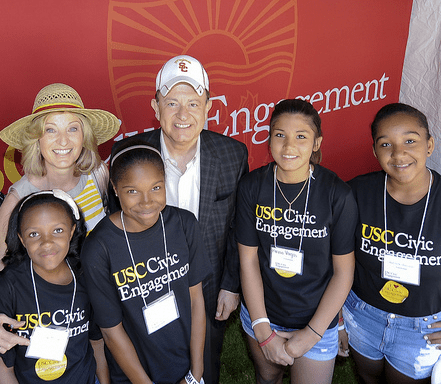 We believe these lasting relationships will strengthen the economic health, sustainability, and stability of our surrounding neighborhoods, while following the trajectory of so many other exceptional USC initiatives. These singular programs reflect the spirit of the USC community. Time and again, as the Trojan Family extends its embrace beyond our campuses, USC and its surrounding neighborhoods stand up together, building bonds and partnerships that benefit everyone for generations.